A few days on the Avon and Stour and two 6lb chub. Having just returned from the Itchen on Thursday evening it was Friday lunchtime by the time I set off to fish the D.Stour and the H.Avon. The method was going to be trotting with maggots being the bait again. 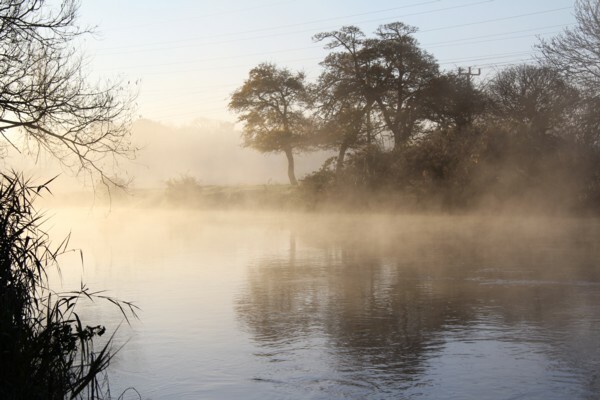 The weather promised to be mild for the Friday and Saturday, but with a hard frost on Sunday morning. I arrived to find the D. Stour running still a little coloured but clear enough for trotting. Being surprised at the height and colour after a dry period of two weeks I looked forward to locking horns with a few chub. It was 2.30pm by the time I travelled down through the Wyle, then the Avon valley’s. I settled in a swim where you needed to cast to the far bank and trot down to willow branches where the chub would lay up. First thing was to catapult out maggots to try and draw them upstream from the willow branches. I normally do this whilst tackling up. This sometimes takes 20 minutes or so, this is sufficient time and gets the chub on the move looking for the maggots. After a few trots down getting the depth right and finding where the weed beds are the float went under where it shouldn’t. The strike met with a solid object pulling back. The chub here try and get into the willows so it’s essential to draw them across away from the danger. The flow certainly helps the chub in setting a great curve in the rod. I tend to walk back up the bank to pull the chub away from the willows too. This must look quite strange to anyone watching. The chub was not huge but at just over 4lbs was a great start. I continued feeding the maggots in to keep the chub chasing around. Soon another chub was hooked and this one was slightly smaller. It’s a fantastic method to use when conditions are right. The wind at time was a pain and made presentation difficult, but in the main it was OK. In the two hours of fishing time before darkness I landed a total of 6 chub with the largest one being the first at just over 4lbs. I did stay on until 7.30pm ledgering but nothing came along. A visit to the local ASDA had me stock up on all the essentials for the next two days. Saturday morning saw me on the fishery again with the morning being cloudy, clearing later. I returned to the same swim again. The approach was much the same catapulting maggots out whilst setting up. In 3 hours of fishing I had caught 8 chub, however all of them between 2-4lbs. The wind increased and the sun came out from behind the clouds and that was it for the day in this swim. I wandered around the fishery making note of the changes from last year in each of the swims. There were some really good fish being caught. It was great to meet Neil who had caught a good few chub in the morning to 6lbs 11oz. I think he went on to catch them to over 7lbs. Then I chatted to a couple of other anglers, just in time to see one of them land a 6lb plus chub. The successful anglers were all trotting, any on the lead were blanking. I was still surprised at how much weed was present and in a few swims that I tried trotting it proved to be very difficult. I wandered up and down the river trying several swims and met some of the anglers on there. Another person I met for the the first time after doing much correspondence was Nigel he was there with his wife and we had a good chat and laugh. The weather was warm and sunny and all was good with the world. I made my way to another area mid afternoon where I thought I would ledger with a boilie in the late afternoon into evening. First of all out went some hemp via a dropper, about 1.5 pints in two different areas as I was using two rods. One where the river shelves up from a deeper pool and another close to a snag on the near bank. 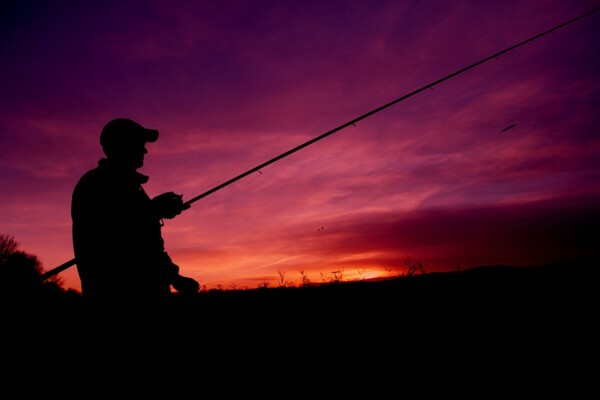 It wasn’t long before I had a few tentative pulls from the chub, I knew that soon one would make a mistake. It didn’t take long, soon a lovely chub of about 2.5lbs came from the near side snag rod. Then it was the turn of the other rod tip to pull over. This time the rod hooped over indicating a much better chub and so it was. A real belter of 6lbs 2oz. At last light I had my 3rd chub from the shelving rod which was just shy of 4lbs. I thought sport might continue into darkness but alas nothing came along other than a continual rod tip rattle from an eel at one stage. So 11 chub for the day plus lots of chatting and a 6lber “happy days”. Day 3 Sunday saw me try a different area of the river. It was bloody cold when I woke in the car. Frost coated the roof and windows. I was warm as toast in the sleeping bag and it took a little more conviction than normal to get out and scrap the windows and set off to the river. 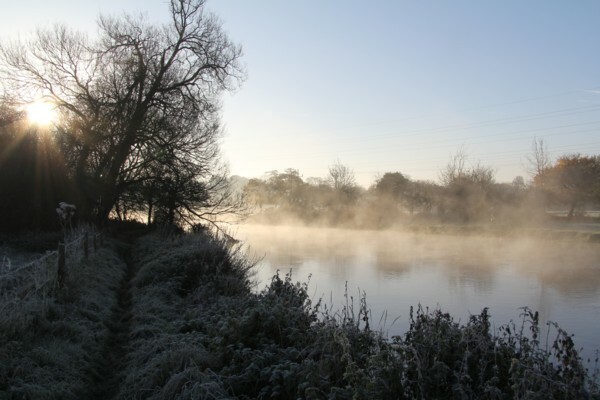 The frost coated most surfaces and mist drifted off the river. It really did feel like proper winter. A few more anglers arrived as the morning moved on. The chub were just not interested in feeding in the bright sunlight. I fished several swims in turn trotting maggots and getting nothing back in return. I wasn’t alone nobody else was catching, it was to be one of those mornings. So 17 chub form the river in two days wasn’t bad going. I thought that a change in river might be in order. So I traveled the short distance to the H.Avon and fished the swim where I had caught a 6lb 6oz chub a couple of weeks ago. I fed with maggots and trotted through the swim. Presentation was very difficult and where in the past you could trot through a great guide today with some weed caught in the willow branches caused the water to boil and push the float off line. 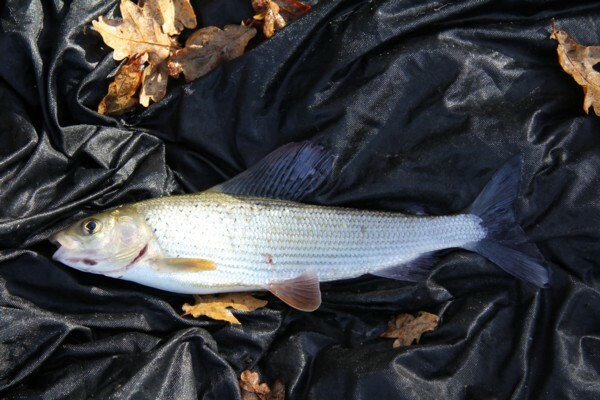 I did manage to catch a lovely grayling of about 8oz or so. Each time I trot this swim I normally catch one or two. The going was very difficult and my arms were tiring from 4 days of trotting the float through the Itchen, Stour and Avon. Spirits needed lifting so I though I would travel to another part of the river. The swim I wanted to fish looked really good last year however I hadn’t fished it before. The walk to the swim involved sploshing through flooded fields and river bank. The river was still pouring over the bank in several places. I had to be careful because it was deep in places. Exactly the same method was used firing out maggots for 20 minutes or so. After an hour nothing was happening. The sun was still very bright. However a warm front was coming in and as the sun dipped behind the cloud at 3.30pm the float disappeared and the strike met with a very solid resistance. That tried to get into the near willow branches. Careful side strain soon had it in the middle of the river. The river flow was so strong I dare not try and pull it upstream. So grabbed the landing net and headed downstream finally netting it in some slacker water. It was big and on the scales went 6lbs 3oz. Soon it was time again to trot through. Spirits raised together with hopes. The float disappeared again and sure enough another chub was being drawn into mid river. This time it was only just over 4lbs. There was still time for more and they did turn up to feed. Unfortunately I lost 4 chub through hook pulls where they just sat in midstream making great use of the fast flowing river. It was going through like a train. So not being too happy with this, I still reflected on a new swim being found plus another 6lb chub. With the sun setting and dusk approaching I didn’t leave it too late to wade back through the water. I didn’t want to take any chances. Safety always comes first in my book! This entry was posted on Tuesday, November 20th, 2012 at 8:30 pm	and is filed under Uncategorized. You can follow any responses to this entry through the RSS 2.0 feed. Both comments and pings are currently closed.